Life at the airport. Life in line. Life is a giant queue. As I stand in line at the infamous Hard Eight BBQ in Coppell, Texas, I realize I’ve been doing a lot of it lately. Standing in line at airport security, standing in line at a restaurant, standing in line at the million opportunities queuing up. Life is standing in line at the airport, with each plane an opportunity missed or taken. Sure there’s the adage of taking life by the horns, the no bars rule to seize an opportunity and not simply wait for something to happen. However, I believe sometimes you must wait for that perfect opportunity, sometimes you’re just not ready. It’s like jumping on a moving carousel, you have to wait for the perfect open spot to jump in. In many ways life has been a matter of finding my footing. There have been many squandered opportunities in my past, career-wise and personal growth. I’ve paid dearly for a lot of it, but I’m finally starting to get to that point where I feel I know what I want and where I want to go. There’s still a lot of broken pieces to put together, still a lot of embedded shards to remove from my broken past, but I know what must be done. Life in Texas has been all right. It’s made me realize a few things. I made the right decision in moving to Seattle. There has never been a bigger affirmation of this. I’ve missed home tremendously. I’ve missed the weather, the people, and my friends. Don’t get me wrong, Texas isn’t all that bad. Certainly the fact that sweet tea is served in place of water at every restaurant has its charm. Then there’s that southern hospitality. Gifts, dinners, tours of Texas have all been offered and I’m ever so humbled and grateful. However, for me, Washington is home. Seattle is where my heart is. I’m TeleCom for life. I thought I was going to be in this industry for a year or two; another passing job. This will be my 10th year and I’m pretty sure I can say this is where I’m going to retire from. Never have I felt like the “prettiest girl at the ball” with so many possibilities in my career path. I don’t know where I’ll land after this project. I hope it’s somewhere new and exciting. As I wait in line at the car rental lot, the woman ahead of me smiles. She’s got two phones in hand and a blue tooth piece in each ear. She’s dressed nicely, in a slim white suit. “Business or pleasure?” she asks. “It’s the look of ‘I can’t wait to go home'” she says. This is my life; I mumble to myself. It’s all a line… a timeline of events. 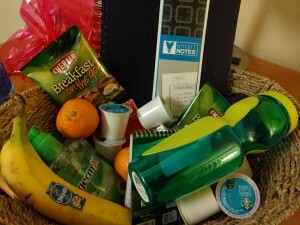 A welcome basket given by local management upon my arrival. 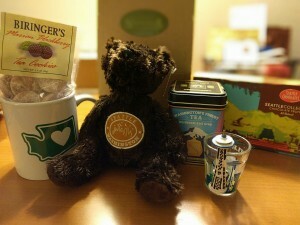 The lovely Veronica from Washington put together a home-sick package. LOVE IT! 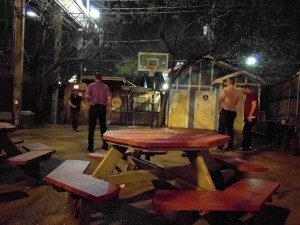 An awesome local bar with outdoor seating and a basketball court. 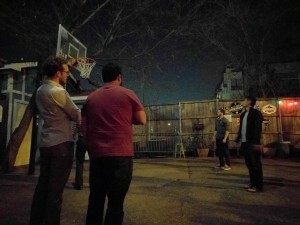 Straight guys play with a gay couple. Complete strangers. Yup. It happens. This entry was posted in Rants/Musings. Bookmark the permalink.